Walls have been a feature in garden design almost since building began, and can be adaptable at creating privacy and defining the garden space. Many people think of walls as a massive, impenetrable structure; and in early times walls were primarily used as a defensive measure. Our Garden wall at Vale’s Greenhouse is more of a “heavy fence”. Most traditional fencing in Southern Alberta is made out of wood or chain link. Of course Katrina saw a rock wall and knew that was the fence for her. 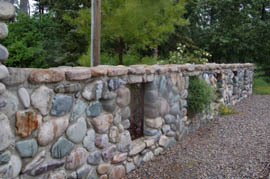 It started innocently enough in 2002 with the first section of fence being constructed next to the alpine bed, with 8 tons of Montana River Rock. Jan Monnissen, a stone mason from Europe who lives in Black Diamond, was contacted and was pleased to be asked to do such an interesting project. 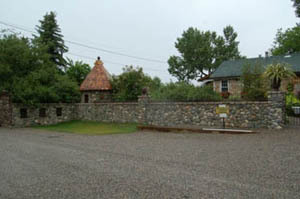 Mountain Ash Stone is the cap or ledger stone, and comes from the Kettle Valley in B.C. 15 tons of rock later, and you’ve got the wall on the south side of the Greenhouse entrance towards the front gates. 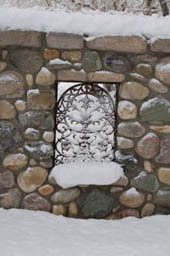 The front gate section was the most recently built in 2005. As you may have guessed, Katrina has an addiction to rock walls now; there is always a plan for a new section. Unfortunately the fires in the Kettle Valley in 2005 destroyed the rock pit where the Mountain Ash Stone was mined and so it is no longer available. As good luck would have it, we do have some on hand, and will continue to build walls until that is used up. “This wall will be here long after I am not here” says Katrina “ probably the next person will come along and think”“why did they build that ugly thing? and knock it down, much like they did with all the sandstone building in Calgary.” But to be sure, the wall is a stunning piece of craftsmanship.